Plans to build a hard runway and associated infrastructure at Redhill Aerodrome have been under examination this week at a Public Inquiry. The aerodrome currently has two grass runways but the owners want a hard runway to allow for larger aircraft, longer flying hours and year-round flying. They have made a succession of planning applications, all of which have been refused. The airfield is wholly within the Green Belt and is reached by narrow, winding lanes. The vast majority of local residents oppose it, as do the local MPs, Parish Councils, conservation groups and Surrey Green Party. Local Greens have supported residents campaigning against the hard runway, and taken part in the Inquiry, which has run for four days so far and continues next week. The Inquiry has been packed and lively. 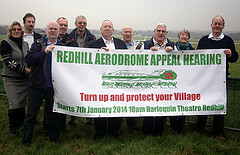 Officers from Reigate & Banstead and Tandridge Councils defended the decision to refuse the runway, and individuals and representatives of local groups raised a very wide range of reasons for objecting, including noise, traffic and road safety, disruption of views and flooding. Green Belt: the hard runway, taxiways and associated development would reduce the ‘Green Belt gap’ between South Nutfield, Whitebushes and Earlswood. Sustainable Economic Growth: The aerodrome’s owners are arguing that the economic growth and jobs they hope to create with a hard runway outweigh the harm to the Green Belt. Jonathan argued that national planning policy refers to “sustainable economic growth”, which prioritises living within the planet’s environmental limits and ensuring a strong, healthy and just society. Localism: The Government’s localism policy means that one of the reasons we might now allow building in the Green Belt is if local people express that that is the way they would like to see sustainable economic growth in their community. If the locals are strongly against a proposal, that should surely mean it is rejected. The aerodrome’s witnesses tried to dismiss concerns and claim that the aerodrome would have to close if it could not gain a hard runway – this despite the fact that the majority of jobs on the site are not related to aviation. Under cross-examination, the aerodrome chief executive, Ann Bartaby, conceded that they will look for more helicopter business in the event of the planning application not going through, thus undermining the case that a hard runway is needed for the business to survive. Greens also object to the intensification of flying at Redhill on climate grounds – any increase in flying is undesirable in terms of carbon dioxide emissions. However this did not form part of the reasons why the hard runway application was turned down, so was not an issue for debate at the Inquiry. The Inquiry continues into next week. The Inspector will then consider all the evidence she has seen and heard, and come to a decision.